Liverpool based Adlib renewed its long standing working relationship with No1 selling UK singer, songwriter and multi-instrumentalist Ellie Goulding on the latest UK leg of her Halcyon Days tour, to which they supplied a Coda Audio sound system. Ellie Goulding’s engineers are Oz Bagnall (FOH) and James Neale (Monitors). Oz specified the Coda Audio system, which once again proved to be a flexible and great sounding solution for the wide variety of theatre and town hall venues. It was the first time that Adlib has worked with Bagnall and also with tour/production manager Derek Fudge, proving a very positive experience all round. Adlib’s crew - systems engineer George Puttock and stage monitor technician Alan Harrison – were also a big part of ensuring that Ellie Goulding’s performance had the best possible live sound. The system comprised 24 Coda LA12s, 16 ViRay and 16 SCPF speaker cabinets, all driven by Coda Audio’s own C10 amplifier and DNC260 system processors. The ViRay cabinets were very flexible being used as down fill cabinets hung underneath the LA12 cabinets or on stage as infills and out fills. This was fine tuned to perfection each day by Puttock, who really appreciates the detail and accuracy of the sound facilitated by the system. Adlib was an early investor in Coda technology, which is proving a real winner as a rental item, offering many new technologies that systems techs like George Puttock really appreciate, for example, the sensor controlled subwoofers and annular ring diaphragms. This enables the system to reproduce the entire audio spectrum with virtually no harmonic distortion or colouration. "This system is great. The guys at Coda have worked at huge lengths to make their systems truly stand out. Call it science or wizardry, when you hear how the Coda system works, you will question everything you have ever known. It really is that good," said Puttock. The SCP-F subwoofers are controlled with Coda's proprietary comparator technology. This enables the amplifier to correct for any nonlinearities present in the driver / enclosure pair. This allows for accurate reproduction and a very fast transient response. Puttock ran these in a left-centre-right configuration to obtain most even coverage across all the rooms. For system processing, one of Adlib’s standard Lake LM26 / LM44 rack packages was utilised. Bagnall cut the mix using an Avid Profile console, chosen because of familiarity and flexibility. Bagnall ran all the vocals through Midas XL42 preamp channels, making use of the XL42's analogue EQ. The signals were then converted into AES using spare input router outputs in the Lake LM26's. The analogue inputs on the LM26 were set to the lowest headroom- allowing for least quantization noise and highest SNR for the conversion to digital. Oz Bagnall first heard the system at one of Adlib’s Coda demo days and was waiting for the chance to give it a proper work out … which came along with this tour. "The top end is absolutely stunning," he enthuses. "It’s detailed, not bright and with lots of clarity," adding that it really works well in all the rooms they are playing, even the highly reverberant ones." Bagnall was very pleased with the results of his first full tour with Adlib. "George and Alan really made a big difference to how it sounded each night – their know-how and attention to detail was very impressive." 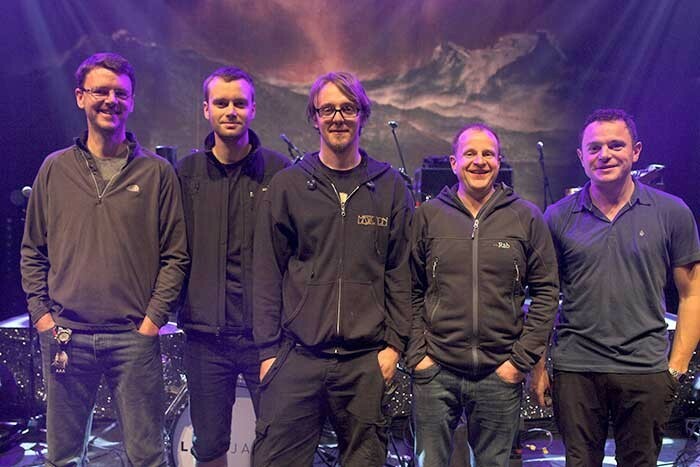 TPi Award Winning monitor engineer James Neale chose one of Adlib’s DiGiCo SD7 consoles, in which he finds a very quick and straightforward user interface. James' encyclopedic knowledge of many of the venues also proved invaluable for optimizing the sound each day. A Sennhesier 2000 series wireless vocal microphone with a DPA d:facto capsule was used for Ellie’s vocal. Sennheiser 3732 – II and 5200 handhelds with 5235 capsules were used for the three backing vocalists. There are no wedges or side fills on stage and the band all use Sennheiser IEM systems - a mixture of Sennheiser 2000 series and G3 systems were used. The radio microphone and IEM’s systems were part supplied by Adlib and the rest owned by Ellie. For the opening acts, Adlib provided eight of their famous MP4 low profile wedges driven by Labgruppen PLM20000Q amplifiers. Tour / production manager Derek Fudge stated: "Having known of Adlib for many years but never having actually worked with them, it has been a pleasure and pain free experience. Oz and James have been happy with the equipment and the crew have been friendly and professional. Bloody marvellous!" Adlib client ,anager Phil Kielty comments: "Watching Ellie and the band develop their live performance over the last few years and deliver such a stunning show has been a genuine privilege. From touring with Bruno Mars stateside to playing the O2 Apollo Manchester, Ellie consistently delivers for her fans. Also Coda Audio is coming into its own on the live landscape." 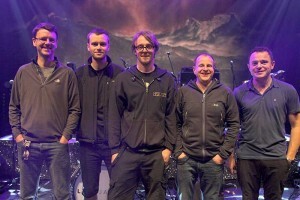 In picture: the Ellie Goulding Crew of Oz Bagnall (FOH engineer), George Puttock (Adlib systems tech), Alan Harrison (Adlib monitor tech), James Neale (monitor engineer) and Phil Ryder (stage manager).